We spent the weekend in Mercer, Wisconsin again this Labor Day, much like we did last year. The mood was certainly less somber, though distinctly muted by the absence no one could ignore. Rob was the guy who would just show up at your cabin with coffee in hand in the morning, or a Budweiser in hand after noon, and talk. He loved being around family and talking about anything and everything. At the same time, the dynamic of the family is as healthy as it ever was. Everyone seems to appreciate everyone else a little more than they used to. Rob's absence has definitely pulled us closer together and the change is for the better. It was part of his legacy that he hoped he would leave and it seems to be happening that way. It was a "blue moon" on Friday and it was a gorgeous night by the fire with family and friends. Everybody was in high spirits and glad to be with each other. The moon was beautiful and we even had a few people around the fire that knew the words to the song. (I wasn't one of them, though the song has some great lyrics.) It was an electric night and one I won't soon forget. The highlight of the weekend however, happened the next morning. The plan was for my friend Steve and I to go out musky fishing on a nearby lake first thing in the morning. 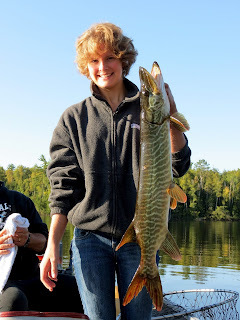 My daughter kind of hinted that she wanted to go musky fishing sometime. I asked Steve if he would mind, and he said he would be glad to take her if she was willing to get up at 7:00 AM and go. My hesitation on asking him is that musky fishing is typically long days in a boat with, at best, one minute of chaos, if someone gets a fish. Sarah has great patience and staying power, so I said she could go. We got on the water about 8:20. Temps were in the mid 60's and the sky was clear. The anticipation was high, despite the fact that musky tend to be pretty finicky in warm weather. I thought our odds of success were about as good as we could hope. Our plan was to have Sarah fish for bass while we row-trolled two suckers and Steve and I took turns casting for musky. Well, one cast into it and Sarah caught a fish. I thought it was a bass so told her to bring it to the side of the boat so I could pull it in. The fish put up a great fight with a couple of nice runs toward the motor. Sarah held tight and didn't horse on the line. When it came up next to the boat Steve said "That's a musky! I can't believe this!" He wasn't even finished getting the suckers in the water yet, nor was he prepared with the net. He quickly got the net pulled out (a nice big net that allows the musky to stay in the water while being unhooked, mind you) and on the second attempt got the fish into the net. It was a 34" twelve pound Tiger Musky, caught on the first cast on a 4" Kalin's Grub using 8 lb test line and a standard spinning rod/reel. It was nothing short of amazing. Sarah was glowing and texted to Donna, "Pardon my language mom, but Holy Sh*t I just caught a musky!!!" She was so happy and said she would be fine with not fishing the rest of the weekend. I can't say how proud I was of her and how glad I was to have the sense to include her on the trip. What a great, memorable Father/Daughter moment! I don't know who to thank, God, Rob or just dumb luck. I just know it was a day I'll never forget as part of a weekend I'll never forget.